During the summer of 2015, former Christian metalcore band Underoath played their first show since disbanding in 2013 and announced the Rebirth Tour - shows dedicated to playing They’re Only Chasing Safety and Define the Great Line in full. The following spring brought them to 31 major cities and thousands of fans who genuinely missed one of the most defining bands of the 2000s. “We got about two weeks into the Rebirth tour and thought, ‘Waaaaait a second. This is too important. It’s too important to our fans and it’s too important to us and the feelings we have playing together are too important to ignore.’ And then we slowly asked the question: What’s next?” drummer/vocalist Aaron Gillespie said in a press release. What was next was bringing the Rebirth Tour all around the world, touring with Bring Me the Horizon, playing festivals and ultimately making their first album in eight years. Erase Me is not only the first album they’ve released in nearly a decade but it’s also the first album they’ve released since stating that they no longer consider themselves a Christian band. It is evident in their lyrical content with songs such as “On My Teeth”. While it caught fans off guard, the band took to Twitter to address their reasoning behind it. Erase Me isn’t an attempt at reviving past albums or staying in the same place, it’s the next logical step of their evolution. While it features more singing than previous albums, the creative and personal growth of each member makes this album unapologetically real. Tracks touch on anxiety, betrayal and mental health in a narrative that removes them from being a band stuck in their beginning era. 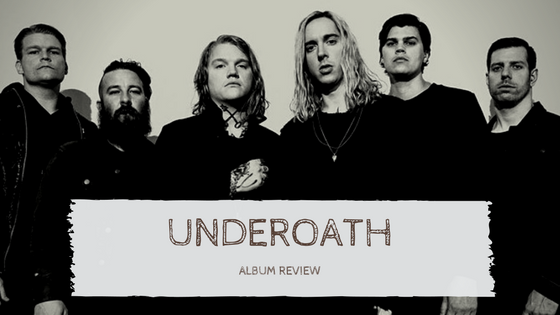 They haven’t strayed away from being creative in their own right and being limitless in their content, but they’ve created a new era of what’s to come next for Underoath.